Sometimes a change of scenery is what’s needed to cause some forward motion, and if that’s the case, then Hyun-soo and Jung-sun are in luck. They’re both still grappling with fear, but perhaps when you’ve already lost the one you love once before, the only thing scarier than admitting your feelings is not admitting them and losing your love for good. Hyun-soo cries as she tells Jung-woo why she quit her drama, and he reaches to wipe away her tears. She pushes his hand away, but he holds on, unwilling to break contact. Hyun-soo whispers that she feels the most sorry towards him, and Jung-woo realizes that she’s putting up a wall between them, like always. He lets go and backs away, saying that he needs time to decide what to do about the show. He asks if she’ll regret this if the show does better after she leaves, reminding her that she can still decide to stick with it. Hyun-soo agrees that she might regret it, and that she may never write again. But she stands firm in her decision, saying that if she stays, it could take a million years to retrieve her pride, and she’ll be dead by then. She says she wants to work again before she’s dead, and he smiles. After their celebratory ball game, Jung-sun and his employees go for a few beers, where he thanks them for their trust and support. He reminds them to stay focused as the restaurant gains in popularity, and gives them two days off to rest. Hong-ah watches Jung-sun’s appearance on the cooking show for the millionth time, remembering him saying that Hyun-soo is his highest priority. She wonders if she really likes him, or if she’s just obsessed with him because he rejected her. Won-joon gets affectionate with Jung-sun after drinking, but Jung-sun pushes him off, complaining that they’re both sweaty. Won-joon gets all giddy when Hong-ah calls him, knowing she’s only calling because Jung-sun rejected her, but unashamed in his love for her. Jung-sun asks if that doesn’t bother him, but Won-joon says his love for her trumps any bad feelings he might have, and asks if Jung-sun has anyone like that in his life. Won-joon is too busy talking to Hong-ah that he doesn’t hear Jung-sun pout childishly, “I do too have someone like that!” He lights up to see that Hyun-soo called him, but when he calls back, she doesn’t answer. She’s deliberately ignoring her phone as Jung-woo drives her home. When Jung-woo drops her off, she thanks him for today, but he tells her to stop saying things like “sorry” and “thank you” because he’s hoping for a different response from her. Hyun-soo just giggles at him when he confirms that he’s trying to get her to see him as a man. Undaunted by the unanswered call, Jung-sun jogs all the way to Hyun-soo’s place with a great big smile on his face. His smile grows when he sees her lights still on, and he texts to make sure that she’s awake. She thinks about how she promised to think hard about whether to accept his feelings, and agrees to see him. She heads out only to find him standing right outside her door. Jung-sun tells her that he went drinking to celebrate the restaurant’s recent popularity, and she thinks to herself, “My worst day turns out to be his best day.” Jung-sun tells Hyun-soo not to come out because it’s late, but he declines to come inside because he’s stinky. He asks why she called him, giving her the side-eye when she says it was a mistake. He quips that she’s most attractive when she’s honest, so she just lost some of her charm, hee. Hyun-soo says thoughtfully that people don’t change—she thought she had, but she was wrong. To “prove” that people do change, Jung-sun says that he no longer wears his shirts inside-out, ha. He closes the door, content just to have seen her face, and waves goodbye adorably before heading home. Hyun-soo watches him through the window, recalling how he said that he never confused her about his feelings, and Jung-woo telling her to stop thinking so much and just follow her heart. Won-joon meets up with Hong-ah at the park, where she decides they’re going for a run. He keeps right on her heels, but he lets her stay a step ahead of him, and as she wins the race, she crows triumphantly that she’s going to win at everything. Since Kyung’s been living in the apartment writing studio where Hyun-soo works, she has to move out now that Hyun-soo quit. Hyun-soo invites her to stay at her place, and she urges Kyung to start working on her own script. Kyung thinks it’s a waste of time since her scripts never win competitions, but Hyun-soo reminds her that Writer Park said that Man Who Eats Rare Steak was terrible, but it still won. Jung-sun’s mother makes lunch for the two of them, all the while bragging about Jung-sun’s looks and success as if she’s responsible for everything. She thanks him for being born as her son, but he ignores this. She asks if he can’t be nicer to her boyfriend Daniel since he makes her happy, but he just tells her to stop basing her happiness on other people. He suggests maturing a bit, which she refuses to do, saying that she’d be too embarrassed about how she’s lived her life, so she’d rather stay immature. Over ramyun, Hyun-soo suggests to Kyung that they go on a trip, and they simultaneously decide to visit Yeonsu, on the coast. Kyung frowns when Joon-ha lets himself in, and when Hyun-soo fusses at him for always asking Kyung for favors, Joon-ha tells her to loosen up and date. Kyung fires off at him, saying that Hyun-soo is way better than him, making Hyun-soo cheer. Annoyed, Joon-ha tells Hyun-soo that Jung-woo is having trouble with the network, and it’s all her fault. Sure enough, Jung-woo is in a meeting with CP Yoo, arguing that since his writer quit, they’ll have to renegotiate the filming budget. CP Yoo argues and tells him to take it up with the executive director. The news gets out that Hyun-soo is off the show, though the “official” story is that she left due to health reasons. Hong-ah scoffs at that, knowing it’s a lie, then calls Kyung to needle her by saying that quitting and being fired are basically the same thing. Kyung doesn’t take the bait and says that she’s going to live with Hyun-soo, and Hong-ah can just mind her own business. Hyun-soo gets a visit from her parents, who ask if she’s dating, and her mom shows particular interest in Jung-woo. Her mother is worried that the articles say she left the show because of her health, while her father thinks she was fired. Hyun-soo corrects him that she quit before she could get fired, ha. Jung-woo calls Jung-sun, inviting himself over for tea between appointments. He arrives just as Jung-sun’s mom is leaving, and Jung-sun is proud to report that Good Soup made money this month. Pleased, Jung-woo invites Jung-sun to hang out tomorrow, and Jung-sun agrees even though he asks why Jung-woo isn’t spending the day with the woman he’s proposing to. Jung-woo just says that she’s not in a good place for that, and Jung-sun jokingly accuses him of making her up. Hyun-soo and her family, including sister Hyun-yi, decide to go to lunch, but they’re all disappointed when Good Soup turns out to be closed. The sisters end up bickering like old times, until their dad complains and they apologize. Jung-sun finds Won-joon in the Good Soup kitchen working on a new technique for brining. Won-joon reveals that he invited Hong-ah for lunch, and he asks Jung-sun not to hate her even though she’s self-centered. Jung-sun says he doesn’t hate her—she’d have to be connected to him in some way for him to feel that way about her. Won-joon says that love takes on all forms, and points out that Jung-sun and Hyun-soo aren’t exactly normal either. As they look for a new restaurant, Hyun-yi admits to Hyun-soo that she liked Unruly Detectives and she understands why she quit. Hyun-soo reveals that the show is about them—it features two warring brothers—and that Hyun-yi is the mean brother, lol. Hyun-yi suspected as much and complains that the director did everything wrong, and Hyun-soo is so happy to hear her say that that she says she can almost forget all the horrible things Hyun-yi did to her. Jung-woo calls in Joon-ha, showing him a script called Nice Soup Does Not Answer the Phone. Joon-ha recognizes it as Hyun-soo’s work, something she wrote even before penning Unruly Detectives, about a chef with the internet handle Nice Soup. Jung-woo says he’s thinking of producing it for a cable station, and Joon-ha begs to be allowed to direct it. Later, Joon-ha calls Kyung, who says she’s not at the studio anymore, and that she and Hyun-soo are going out of town. Jung-sun is still hanging out when Hong-ah arrives for the meal that Won-joon made. She snarls that seeing Jung-sun is killing her appetite, then tells the guys that Hyun-soo got fired. She sighs at Hyun-soo’s lack of resolve when she worked so hard to get here, making Won-joon joke that she almost seems to care about Hyun-soo. Determined to ruffle Jung-sun’s feathers, Hong-ah says that she hopes that he suffers a lot because of Hyun-soo. But Jung-sun just smiles and offers to fulfill that wish, and to love Hyun-soo as much as he suffers. While out for a jog, Hyun-soo thinks back on her relationship with Jung-sun, from their first meeting five years ago to the present. Jung-sun is also running and thinking about Hyun-soo, and he ends up at their corner, where he finds Hyun-soo’s little flower just beginning to grow again. It’s Hyun-soo’s turn to startle Jung-sun as he’s mesmerized by the flower, and he grins to see her. He tells her that he saw the article about her leaving the show, and she sighs that making decisions is hard, but once she does she never looks back. When Hyun-soo says that she’s going on a trip tomorrow, Jung-sun actually stammers, “Wi-with whom?” and he relaxes when she says it’s just Kyung. When he gets home, he calls Jung-woo to cancel their plans for tomorrow. Jung-woo complains but agrees, then hangs up when Joon-ha comes to him all excited. Joon-ha says that Jung-woo has spent too much time pining for Hyun-soo, when she’s probably just waiting for him to make the first move. He offers to help them get together, suggesting they arrange an accidental meeting. As they’re packing for their trip the following morning, Hyun-soo and Kyung are surprised when Jung-sun shows up at the door unexpectedly. He claims to be here to carry their luggage, totally inviting himself along, which pleases both ladies. Joon-ha and Jung-woo are also on their way to Yeonsu, though Jung-woo isn’t nearly as excited as Joon-ha about his plan to surprise Hyun-soo. In fact, he seems incredibly unsure about the wisdom of this plan, and more than a little annoyed with bouncy Joon-ha. Kyung can hardly hide her enchantment with Jung-sun, who complies with all of her requests to turn the music on, then back off again as she squees to herself in the backseat. She admits she’s playing boyfriend/girlfriend, though she teases Hyun-soo that it’s really her business, and an amused Jung-sun smiles right along with her. In Seoul, Hong-ah meets up with Writer Park, who congratulates her on winning the writing contest. Writer Park says she’s distraught because Hyun-soo is badmouthing her all over town, protesting her innocence regarding Unruly Detectives. Even Hong-ah looks uncomfortable at the blatant lies, but she just tells Writer Park that if Hyun-soo is badmouthing her, that it won’t hurt her reputation much. Writer Park whines that she’s having trouble getting another show, then she suggests that Hong-ah use her family connections to talk to CP Yoo about a possible job. In the privacy of her hotel room with Hyun-soo, Kyung goes nuts over Jung-sun, calling him super great and saying he’s got stars in his eyes. She says she’s only letting Hyun-soo have him because it’s her, and then gets grumpy again when Joon-ha calls her to meet him in the lobby. Jung-woo says that he’s got some business to take care of while he’s here, and Joon-ha doesn’t seem too upset to hang out with Kyung on his own. As they’re talking, Jung-sun walks right past them, somehow managing not to notice them as he waits for Hyun-soo. Jung-woo sees him from behind, but doesn’t seem to recognize him. When Hyun-soo comes downstairs, she takes a moment to watch Jung-sun waiting for her, a tender look on her face. When he sees her, his face breaks into a giant grin, and he gives her that adorable little wave of his. Oof, he’s killing me with that smile. They take a boat tour of the bay, enjoying the beautiful day. A wave tilts Hyun-soo into Jung-sun’s arms briefly, and they send shy little smiles at each other. Finally Hyun-soo speaks, saying that she’s hungry, and Jung-sun laughs at her for breaking the mood. Hyun-soo asks why Jung-sun decided to come here with her, and he says coolly that he was bored. She quotes his own words back at him, saying that he’s attractive when he’s honest, but he just lost his charm, ha. After the boat, they take a break for marinated crab, the local delicacy. Back at the hotel, Kyung and Joon-ha eat together, and when Kyung takes her glasses off to avoid the steam from her soup, Joon-ha says she looks prettier with them on. Kyung responds with stony silence, but when Joon-ha asks if he offended her, she snaps that she’ll take off her glasses whenever she likes, thank you very much sir. Joon-ha sticks his foot right back in his mouth by telling Kyung to just speak in her native saturi instead of her strained Seoul accent. Kyung has to admit that she’s trying too hard to sound like she’s from the city, but that she wants to seem mysterious. He laughs at that, and she warns him that she’s only being polite because he’s buying lunch. Meanwhile, Hyun-soo and Jung-sun visit the rock crevices, which local legend holds will grant a wish if you pass through all seven of them. They each make a silent wish, and Jung-sun tells Hyun-soo to be careful not to get lost, but she brushes off his concern. Hong-ah meets with CP Yoo and gives him a copy of her script (titled High Society—HA, nice meta reference!). CP Yoo spots Director Min and calls him over. He’s still complaining about the script of Unruly Detectives even with the new writers, and CP Yoo says it’s not too late to get Hyun-soo back, but Director Min refuses. He recognizes Hong-ah as Hyun-soo’s former writing assistant, and asks if she can give their writing team some advice, which she understands right away as code for “come aboard as the new writer.” She coldly wonders why she should jump back onto a sinking ship, and Director Min is impressed with her deft use of words. Hong-ah isn’t interested, but he tempts her by saying that he’ll direct her next drama if she finishes Unruly Detectives with him. As Jung-sun and Hyun-soo sit enjoying the view, Hyun-soo excuses herself to the ladies’ room. Jung-sun tells her again not to get lost, but she protests that she won’t because she’s been here before. She decides to do a bit of solo exploring, and when she doesn’t come right back, Jung-sun grows worried and tries to call her. But of course she left her purse with him, with her phone inside it. Jung-sun goes looking for her, so when she comes back to the spot where she left him, she finds him gone. They both set out to search, growing more and more concerned when they can’t find each other. Hyun-soo narrates that she could only think of one thing in that moment: “I must see Jung-sun.” Things he’d said to her race through her mind as she runs all over looking for him, about how she pushes away the man who loves her and how she should give up on him if that’s all her feelings amount to. She backs up, and in a rush she confesses that she meant to call him “jagi,” and Jung-sun grins, asking if that’s important right now. Laughing through her tears, Hyun-soo says that she has to set things right. She says she’s going to stop thinking, because she lost him once because she thought too much, and she’s spent five years thinking about it. With a big happy smile, Hyun-soo tells Jung-sun, “I love you. I’m in love with you.” A look of wonder comes over his face, and he tells her, “I know.” She immediately chastises him for being so mean when he said she might push him away again because there’s nothing stopping her from doing it twice, but Jung-sun only says with a laugh that he warned her he was difficult in other ways. Jung-sun softly tells Hyun-soo to stop talking, and opens his arms wide. She falls into them, and they stand there for a long time, savoring the moment. Just as Jung-woo finishes up his business, CP Yoo calls him to change the terms of their agreement. He wants to fire the two other writers they hired, and hire Hong-ah instead. Otherwise, he warns that Unruly Detectives may get an episode cut, which could be devastating for On Entertainment. When Joon-ha learns that Jung-woo is on his way back to the hotel, he urges Kyung to find Hyun-soo. She texts Hyun-soo, but she and Jung-sun are enjoying their time together too much, so Hyun-soo decides to stay out. She does tell Kyung she’s at the Soho Dongdong Bridge, which Joon-ha reports to Jung-woo. He tells him it’s a romantic spot, perfect for an “accidental” meeting. He asks Kyung why Hyun-soo would go there alone, but she says she’s not alone—she’s with a guy. Joon-ha frantically calls Jung-woo and says that Hyun-soo isn’t at the bridge after all. But Jung-woo decides to go to the bridge anyway, as long as he’s nearby. 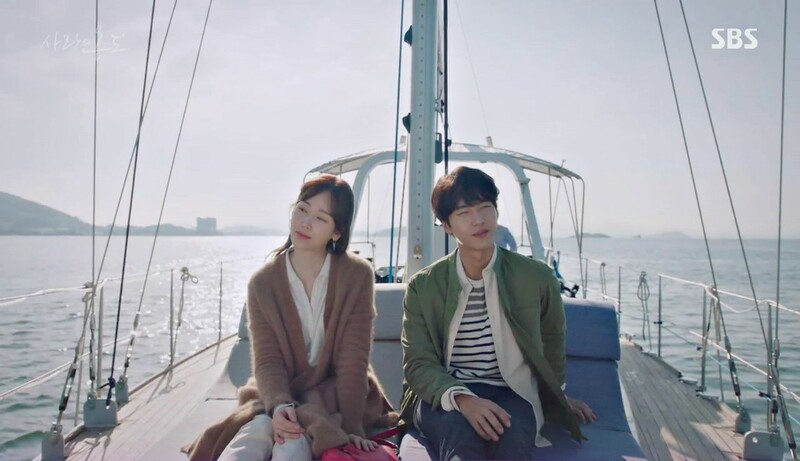 Hyun-soo and Jung-sun sit by the water, and Jung-sun cutely scoots a little closer to Hyun-soo so that he can slide an arm around her. He watches her carefully for any sign that it’s not welcome, but she just leans her head on his shoulder and relaxes into him. Hyun-soo murmurs that she wishes time would stop, and Jung-sun responds by taking her hand in his. They sit there smiling, just happy to be together. Across the water stands Jung-woo, who’s spotted them from the bridge. He remembers Hyun-soo saying that there’s a man she loves, stunned by the realization that that man is Jung-sun—the friend who’d promised to help him plan the perfect proposal dinner. Let this be a lesson to Jung-woo: Date the lady a bit before you plan your entire future around her. Of course he can’t help his feelings, but Hyun-soo has pretty consistently thrown up that wall whenever he tries to make their friendship into something more. So he really has no right to be upset to see Hyun-soo with another man. I do understand that a large part of his inevitable feelings of betrayal will be because of who she’s with, but he can’t exactly be angry with Jung-sun or Hyun-soo for not telling him that they are emotionally entangled, when he himself has been keeping the object of his affections from Jung-sun. Well, he probably will be angry, but it won’t exactly be fair. I’ve said that I dread Jung-woo’s reaction to this news, but the truth is that I’m actually looking forward to him having a complete fit about it, for purely masochistic reasons. We’ve seen hints of darkness underneath Jung-woo’s calm, controlled demeanor, and Jung-sun has hinted at Jung-woo’s response to his and Hyun-soo’s relationship using words like “rage.” I dread it, but I also want to see Jung-woo just totally lose it, in part because I know that Kim Jae-wook will be brilliant and in part because I want to see Hyun-soo and Jung-sun grow closer in the face of conflict this time, rather than let it pull them apart again. As for Hong-ah, I was surprised to see her actually show some self-awareness in this episode, even if only for a second. The fact that she even wonders if her obsession is only because Jung-sun rejected her (spoiler alert: YES) shows that she’s not as completely oblivious to the truth as we thought. That doesn’t mean that her behavior was any better, particularly the way she wished unhappiness on Jung-sun right to his face, but at least her vitriol has very little chance of actually upsetting him. I do think that Hyun-soo is hurt by Hong-ah’s bitterness, but Kyung is a better, more genuine friend than Hong-ah ever was, and although Hyun-soo is bewildered by Hong-ah’s willingness to throw away their friendship over a guy who doesn’t even like her, she doesn’t seem devastated. The only way that Hong-ah can truly hurt Hyun-soo is professionally, which it looks like she’s about to do. But what’s important is that Hyun-soo finally said it! She finally told Jung-sun she loves him, and I thought his response was perfect—he already knows, he was just waiting for her to figure it out. And I just love how unfailingly respectful Jung-sun is of Hyun-soo, never assuming that his advances are welcome even after she tells him she’s in love with him. The way he reached his arm around her, all the while watching to gauge her reaction, somehow doesn’t read as insecurity coming from him. To me it’s more like he has an old-fashioned sense of chivalry, with a healthy dose of seeking confirmation that she wants the contact as well. It also explains a lot about why he’s simply laid down a trail of breadcrumbs for Hyun-soo this time around, since he was much more direct five years ago and it backfired on him, badly. It makes sense that Jung-sun would be a lot more subtle about declaring his feelings now, and then let her come to him. I have a feeling that all the bad things are going to hit all the fans next week. But for now I’m just happy that Jung-sun and Hyun-soo finally found their way back to each other, after so many years of separation. I’m confident that no matter what happens, they won’t let anything come between them again, because now they know exactly what they stand to lose.